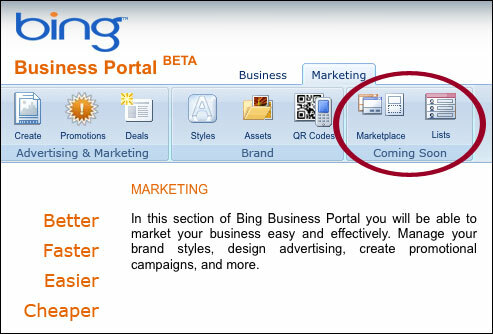 Two new features have shown up as “Coming Soon” in the Bing Business Portal: Marketplace and Lists. And like many features in the BBP, they show Bing’s intention to make the BBP a full-service marketing platform that goes far beyond local search listings. Here’s a quick look at each of the “coming soon” features. 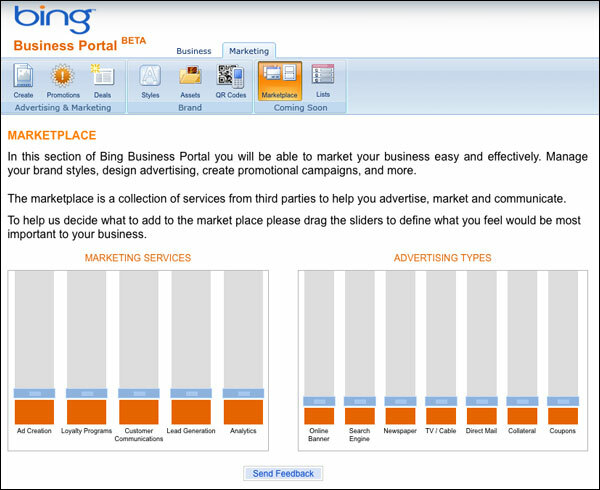 On the Marketplace page, Bing is asking small business owners to indicate what types of marketing services they’re more interested in. There are sliders that let the SMB “vote” for things like analytics, ad creation, direct mail, TV/radio advertising and more — Bing will presumably work on adding 3rd-party providers/tools for the most desired choices. Much like the Marketplace page, the Lists page also has sliders that the small business owner can use to tell Bing what his/her priorities are here — but there’s no mention of 3rd-party providers here. This tool appears to deal with creating and managing mailing lists and customer lists for both online (email) and offline efforts (mailers, loyalty programs). The text mentions “market place,” but I think that’s a typo leftover from cutting-and-pasting the actual Marketplace copy. I’ve tried unsuccessfully to get more information from Bing about these new features. They’ll have a strong presence (and a keynote presentation) at the GetListed.org Local University workshop this Friday in Spokane, so maybe we’ll all learn more then. 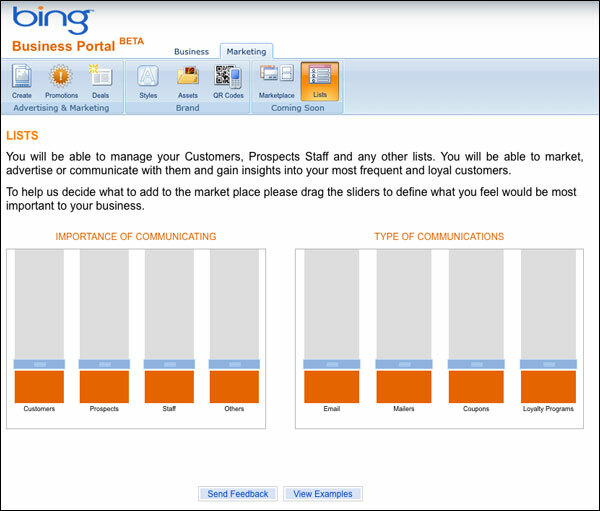 In any case, if and when these new tools go live, they’ll represent yet another step in Bing’s quest to make the Business Portal a full-service platform offering a lot more than just local business listing management. Any more news on this? I want to know when will Bing offer analytics on local listings? Nothing new that I’ve heard, Scott.